Who says that every Super Bowl party’s got to be filled with total and complete crap? I believe that you can totally indulge during the biggest football game of the year with healthy gluten free Super Bowl snacks and drinks that everyone (even the gluten-eaters) will love. Even though I talk a lot about eating healthy, I’m just as human as the next person and occasionally I like to spurge on certain gluten free foods that might not be “healthy”, but are healthier than the typical junk most eat for say… the Super Bowl. So that you can enjoy this yearly American past time, I thought I’d offer some suggestions of some healthy gluten free Super Bowl snacks that will hit the spot without making you feel awful the next morning. I’ve included a mixture of some of my recipes and products (none of which I was paid to talk about or mention). Though I wouldn’t necessary suggestion making Super Bowl snacks a daily habit, enjoying these items occasionally isn’t the end of the world and can make your Super Bowl party feel more “normal”. Late July is a great company that offers a wide variety of certified organic gluten free tortilla chips. I’ve written about them in the past here on the blog (you can read up on all the different flavors – Sea Salt, Mild Green Mojo, Sweet Potato, Dude Ranch & Red Hot Mojo). So whether you’re hoping for something crunchy to go with dips and chili, or you want a snack that’s reminiscent of those Doritos flavors without all the funky, toxic ingredients, Late July is perfect. A couple of summers ago, I figured out the easiest way to make really taste salsa in under 3 minutes with very few fresh ingredients (honestly… salsa is one of those things that just tastes so much better made fresh than out of a jar). CLICK HERE to nab the recipe! Use a small food processor and make a bunch before the big day that everyone will enjoy eating with some chips and guac! Wings are the favored meaty finger food on Super Bowl Sunday! If you don’t have a trustworthy restaurant from which to place an order, make your own using the wing and barbeque sauces from Gator Ron’s. Gator Ron’s sauces are vegetarian as well as gluten, dairy, fat and GMO-free. They also contain very little sugar (which is hard to find when looking for a commercial produced barbeque sauce. If you plan on grilling, these sauces can be used on any meats and even fish/seafood. They are highly versatile, but full of flavor that everyone will love. For more information on how and where to purchase Gator Ron’s, CLICK HERE. Though I might not be a big beer fan, when I think of football, I think of beer. If you’re gluten-free, check out New Planet Beer as an alternative to your traditional gluten-filled versions from years past. Let your non-gluten-free friends know they can bring a case of their favorite stuff because you’ve taken care of yourself. However you may also find that your gluten-eating friends won’t mind the difference. My husband (the gluten-eater of the house) enjoys it and doesn’t notice that much of a difference. If you’re like me (not a beer fan), check out some hard cider from Angry Orchard. They have a variety of flavors and honestly, everyone (gluten free or not) can enjoy these alcoholic beverages. It’s just something else you can have for the party that will make your Super Bowl Sunday feel like normal. Angry Orchard is what I personally buy for the occasional indulgence on the weekends or at barbecues in the summer as well. 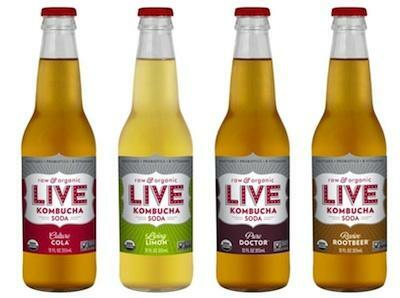 A new twist on the traditional soda, Live Soda is made from kombucha. It was one of the most memorable and innovative new products I found at Expo East 2013. They’ve got four flavors available (Living Lemon, Culture Cola, Revive Rootbeer, and Pure Doctor) which are all modeled after traditional soda flavors. Another perk is that these sodas are low in sugar (only 9g per serving) for a soda and contain the healthy bacteria that you’d expect from drinking a kombucha beverage. My absolute favorite is the Revive Rootbeer. This is definitely an awesome addition to the party! Comment below sharing your favorite Super Bowl Sunday food & drinks!